We have an oversized cast iron ladle in our home that was used for making maple syrup. 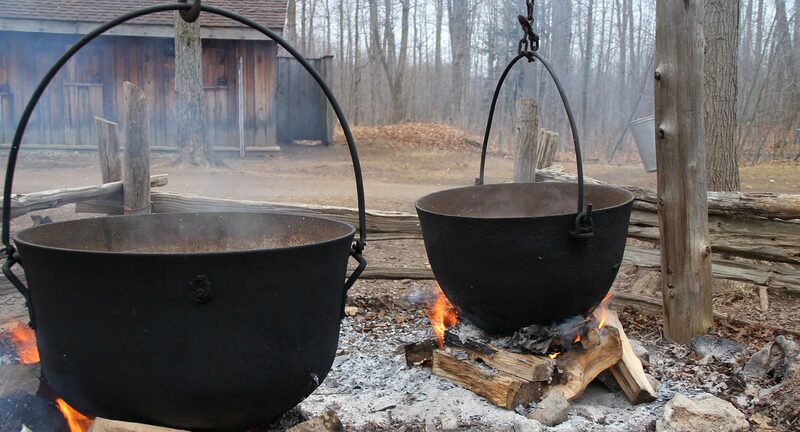 I like to imagine the excitement of youngsters, cheeks rosy with the cold, standing in spring snow waiting for the syrup to boil down, the steam scented with burned sugary scrapings. Many of us have rubbed our fingers through freshly dripping sap and savoured the sweetness of nature’s gift. Later we learned that the rich sap tastes even better after it has been boiled down. Our ladle serves as a reminder that my best writing takes place over a long period of time, and is richer for the time taken to boil it down and edit. All writers have their own method(s) for writing and editing, but this is the one that I have discovered works best for me. I tend to over-write and pound out first drafts fairly quickly. A short story will often start out as fifteen pages and a year later, will finally be finished at five pages. I consciously attempt to boil down the story so that it becomes efficient. Donna Morrissey, a dear friend and mentor, speaks about getting to the heart of the story and that is certainly central to my efforts. Life is busy and I don’t want to bore readers with extraneous material that dilutes the impact of the central element or takes us too far from the heart of the story. I typically boil a short story down by two-thirds, often finishing twenty drafts before showing anyone my work. There are writers who are able to dash off a first draft in a way that that uses language in a precise and evocative manner without the need for polishing or editing. They are the truly blessed! I struggle with word choices, unnecessary dialogue, syntax, description, punctuation, paragraph order, and just about anything else that involves leaving a mark on the page. Part of the editing process involves reading the work aloud. Until it is very nearly finished, I will only read it to myself. My ear picks up on those phrases that clunk or that my tongue has difficulty with. Because I love story-telling, I have a tendency to tell too much and not show (the dreaded critique!). As I am editing, I ask myself whether there is too much telling or whether my perspective needs to be switched. Most often, it is a matter of taking away, in order to leave only the essence of the story intact. I try to leave space for the reader’s imagination to enter into the text and to provide its own coda. Is the factual information correct? Does it provide a sense of verisimilitude? If applicable, are the details accurate for the period? Is there a sense that the central characters are well-rounded with both flaws and attractive qualities? Has the language been massaged so that the voice is consistent? Is the vocabulary accessible and appropriate? Have I invoked a sense of closure and invited the reader to contemplate something that rings true from their own experience? Finally, when I feel that I am getting close, I share my work with a critical friend. This should be someone whose judgement about writing you trust implicitly. Critical friends need to be cultivated closely. Work can be harmed by people who do not have the skills to be constructively critical. Editing someone’s work can be extremely intimate and you need to select this person very carefully lest an important relationship becomes damaged. I hope this is helpful to your own writing and editing process. Send me a message and let me know!